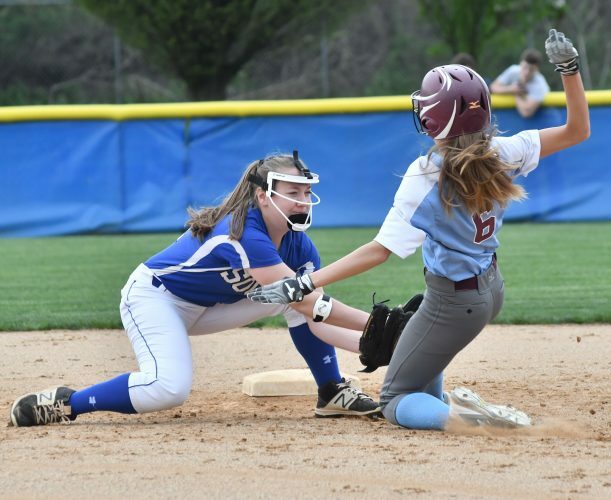 Quite bluntly, South Williamsport first-year coach Chris Vanaskie expects the Mounties to be competitive in every game this year. Given the success the team has had the last few seasons including last year, it’s not a stretch to expect that. “If we give 100 percent all the time and never give up, then we will have a chance to win every game we play,” Vanaskie said. After numerous years coaching at St. John Neumann with both the boys and girls programs, Vanaskie is at South Williamsport this year for his first year with the Mounties. The Mounties return plenty from last year, including Dean Seman, Aaron Bird, Tayge Molino and Brian Yaos, but Vanaskie noted younger players will also have to step up for the team to continue to have success. “We’ll need younger players like Curtis Sauers and Caleb Snyder to step up and have breakout seasons,” Vanaskie said. South Williamsport won 10 games last year and Vanaskie said the goal this year was to qualify again for the postseason. And the Mounties weren’t the only area team from the HAC-III that got into the playoffs. Montoursville got into the postseason and lost in the District 4 Class AA quarterfinals in a shootout with eventual district runner-up Midd-West. Kevin Werkmeister expects Montoursville to be competitive and once again around the same record-wise. The Warriors lost a key player in goalie Ben King, who is playing at Susquehanna. Montoursville returns Seth Griggs, Alexander Bohlin, Nick Musto, Dominic Caputo and Angelo Silvagni, who were all contributors last year. Hughesville lost to eventual state champion Lewisburg in last year’s playoffs, but the team took positive strides in qualifying for the postseason. And the Spartans, who won seven games in 2016, return two huge pieces to their offense from last year in Austin Lewis and Nick Sharayko. The Spartans also return two defenders in Evan Onufrak and Brody Heller and midfielders Justus Leighow and Blake Sherwood. Warrior Run last year had a talented trio of attackers in Hunter Confair, Cody Rogers and Jordan Morrison, but just Morrison returns as the other two graduated. The team lost roughly 50 goals from last year in graduation, but Andy Bieber feels his team has plenty back. Roster: Seniors: Jonah ISaacson, Mason Mensinge,r Nick Musto, Seth Griggs. Juniors: Alexander Bohlin, Austin Norton, Dominic Caputo, Elijah Ward, Mason MacInnis. Sophomores: Alexander Kremer, Angelo Silvagni, Bodie Kaufman, Colin Gorini, Ian Plankenhorn, Jonathan Schaefer, Justice Wheeler, Luke Kirkpatrick, Tristian Shirk. Freshmen: Andrew Mayo, Michael Wise, Jacob Foster, Xavier Becker, Zach Baylor, Ian Foote. Roster: Seniors: Aaron Bird, Jared Kelly, Shyler Kreitz, Dean Seman, Riley Shaffer, Jared Wheeland. Juniors: Dominic Caroway, Tayge Molino, Franklin Summerson, Brian Yoas. Sophomores: Jimmy Brokaw-Stealey, Nate Persun, Curtis Sauers, Mason Shatzer. Freshman: Brendon Bowman, Port Habalar, Zachary Hanisek, Riley Hockman, Ian Rhea, Caleb Snyder, Gage Zimmerman. Roster: Seniors: Evan Onufrak, Nick Sharayko. Juniors: Gavin Bassler, Isaiah Savage, Mason Lomison, Brody Heller, Brent Taylor, Steven Millheim, Dylan Taggart, Ben McGovern, Andrew Miller, Ryan Strimple. Sophomores: Spencer Thomas, Drew Bieber, Ethan Poust, Austin Sheatler, Justus Leighow, Ethan Strother, Austin Lewis, Blake Sherwood. Freshmen: Dylan Figels, Gabe Larsen, Brandon Moore, Jacob Rouhoff, Logan Burns, Jackson MIddleswarth, Ethan Jackson. Roster: Seniors: Jordan Morrison, Kylan Kurtz, Kolbe Welliver, Keefer Goodspeed, David Myers, Wyatt Fisher, Trey Gresh, Andrew Shultz, Tucker Hays. Juniors: Alex Freerick, Ryan Neamand, Levi Kennel, Ausitn Soltesz, Ethan Whitmoyer. Sophomores: Logan Witmer, Keegan Jenkins, Tyrese Hazzoum, Ryan Singer, Sam Crawford, Zach Schaeffer, Ben Temple, Jared Emmert. Freshmen: Duncan Bender, Max Kennel, Noah Pick, Ryan Ranck, Logan Confer, Brendan Geiger, Hunter Rovenolt, Alex Hazzoum, Anderson Bieber, James Branthingham, Landan Kurtz, Kaden Majcher.